[shareaholic app="share_buttons" id="15180628"]Climate change is all around us. Even though this is well-known, planning to live with climate change has been less commonly discussed. 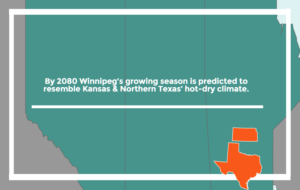 In the media, we hear a lot about California’s climate issues and droughts in states like Texas, but we don’t hear much about climate change impacts on the Canadian Prairies. Well, now you can find out more about these impacts through the Prairie Climate Centre (PCC). The PCC is a joint venture between the University of Winnipeg and the IISD (International Institute for Sustainable Development), that fills the gap between current plans for the economy, infrastructure, society and the environment and the impacts resulting from climate change. Their Prairie Climate Atlas web page visually publishes their climate prediction models to help inform the public. Science is often accused of not being transparent or informative to the general population, the interactive Atlas doesn’t follow this trend, instead, the Atlas doing just what science should be doing, sharing research in a user-friendly form. The Prairie Climate Atlas provides a number of ‘geovisuals’ to help visitors interpret the expected change over time. Such visuals are maps and graphs of the projected temperatures, day’s ≥30°C and ≤-30°C, precipitation, and the period of frost-free days. The results of their high and low prediction both suggest that climate changes are occurring quickly, and by 2050 the Prairie climate will look more similar to our southern neighbours. In a recent Globe and Mail article, Ian Mauro and Danny Blair co-directors of the PCC explain there will be “more forest fires, drought, flooding and extreme weather events that will have enormous consequences”. Geovisuals of the current, near and far future climate estimate potential scenarios of the Prairies. The Prairies account for >80% of Canada’s farmland, for Canada’s agriculture, this means a significant impact on yields and food prices from potentially increased droughts and floods. So how do we prepare for changes in climate, farming, and lifestyle? According to the PCC Planning Director Hank Venema, the Prairies adaptation priorities should be water management, agriculture, forestry, public health and infrastructure. Further planning is needed to ensure that proper infrastructure is in place for future climate change. Increasing temperatures could lead to a greater reliance on water for crops and communities, therefore, improved water management and storage is needed to collect rain and runoff. Finally, to ensure future food security and sustain yields from agriculture, we will need to continuous improvement in crop varieties that tolerate a warmer, and more variable climate. The predictive nature of climate models is informative in demonstrating potential scenarios. While there is a multitude of climate models available, the PPC model specifically focuses on the future of the Canadian prairies, by drawing attention to possible Prairie climate scenario. As the climate changes, what can we do about it? Find out more about what the PCC suggest by visiting their web page and Atlas. You can check back regularly for new data, documents, and research or keep up to date by following PCC on twitter: @PrairieClimate. If you want to know more about how the PCC makes their predictions, on the Atlas homepage, click the menu button for additional information.